Goon but not forgotten. 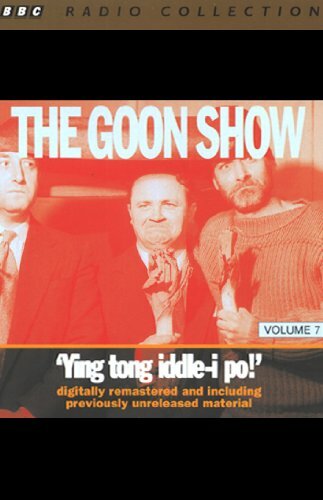 From 1952 to 1960 the Goons ruled the airwaves, the most celebrated and influential clowns in the history of radio. Only Peter Sellers, Spike Milligan, and Harry Secombe can allow you to do this through another crazy quartet of cult comedy classics, all digitally remastered. This collection features the following episodes: "The Whistling Spy", "The Affair of the Lone Banana", "The Great Tuscan Salami Scandal", and "Scradje". The BBC have ransacked their trashbins and have discovered strange talking-type magnetic tapes. Using modern electronic-type technology, they have converted these to talking-type all-leather mp3 files, and offer them to you, the discerning public, to while away you idle hours. I advise you to download one as an experiment, and feed your ear canals. Your life will be changed forever. You will attract strange glances from this point on, but be brave. Your main challenge in life fron then on will be to bluff your way out of trouble when the guys with the white coats arrive. Most of these radio programs are hystericaly funny, very British, not politically correct (remember WHEN they were made) and well worth the price. i had them on audio tape from our local Classical radio (once a week program) and have worn them out. I've been looking for them for some time and just came across a reference to check Amazon, went to Amazon and was sent to Audible. If I didn't already HAVE a membership at Audible, I'd get one just for these.